Thank you so much to everyone that joined in with CookBlogShare last week. There were so many delicious recipes shared. When it came to deciding which to feature in this weeks round up I had a really tough job. But the sweet recipes won again. The recipes that I have chosen contain some of my all time favourite flavours and they are all recipes that I really want to have a go at. First isThe Not So Creative Cook - Nutella Croissant Pudding this recipe had me hooked as soon as I saw the word Nutella. I find Nutella simply irresistible. Chocolate and hazelnuts are one of my favourite combinations and combined with warm croissants in a pudding sounds and looks like a pudding made in heaven! Irresistible! Next is A Strong Coffee - Rolo Cupcakes. What is there not to love about this creative recipe? Rolos take me back to my childhood. I will definitely be looking at getting some of the caramel that was used in this recipe for some cakes! Genius idea! Next is Mother Mands - Bilberry Meringue. Having 3 chickens we often have more eggs than we need so I am always looking for new recipes that use eggs. This Bilberry Meringue looks and sounds delicious. I was impressed by how neat the meringue remained after slicing, mine usually crumbles to bits! This dessert is perfect for a summers evening. Last and by no means least is Kerry Cooks - Vanilla, Honey, Sea Salt Peanut Butter. Wow is what I said as soon as I saw this recipe. I love peanut butter but have never thought of making my own. But after seeing Kerry's recipe I will definitely be saying good bye to mass produced, shop bought peanut butter and making my own! Tomorrow CookBlogShare is hosted by Beckie at This Is Not My Home so please pop over and share any of your foodie post, both old and new and enjoy! Oh thanks - I must admit to have felt a genius making them :-) good job my boys eat all the cake I make. I must say those others look amazing - Nutella crossaint pudding what's there not to like!?! Mmmm. 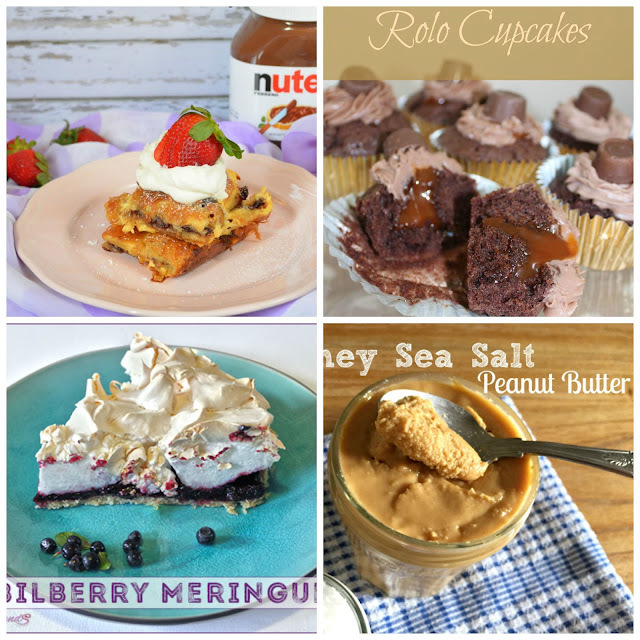 the bilberry meringue and Kerry's peanut butter look delicious!! I seem to have forgotten to link last week, where did the time go? Will go and link to this week pronto.